By now you’d think we’ve seen just about every means of robotic actuator possible. We have Cartesian bots, Stewart platforms, SCARA bots, Delta bots, and even some exceedingly bizarre linkages from [Nicholas Seward]. We’re not done with odd robotic arms, it seems, and now we have Delta-ish robots that can move outside their minimum enclosed volume. They’re fresh from the workshop of [Aad van der Geest], and he’s calling them double and triple Deltas. Previous Delta robots have used three universal joints to move the end effector up and down, and side to side. They’re extremely fast and are a great design for 3D printers and pick and place machines, but they do have a limitation: the tip of a single Delta can not move much further than the base of the robot. By adding more parallelograms to a Delta, [Aad] greatly increases working volume of a his robots. 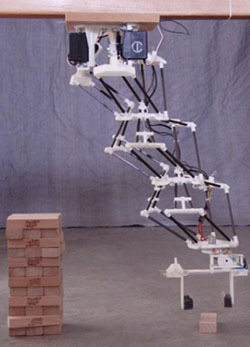 One of the suggested uses for this style of bot is for palletizers, demonstrated in the video below by stacking Jenga blocks. There is another very interesting application: legs. There’s footage of a small, simple triple Delta scooting around the floor, supported by wire training wheels below. It makes a good cat toy, but we’d love to see a bipedal robot with this style of legs. The points of those geometric shapes line up perfectly thanks to the delta robot arm controlling the light source. The source is a simple LED that can be switched on and off as it moves. A camera is set up in a dark room to keep the shutter open while the arm moves. We’re assuming that all of the light for the stationary objects in this image comes from the LED as well. [Sick Sad] built the delta bot for just for this purpose. Check out the video below to see, and perhaps more importantly hear, the thing in motion. Seriously, the whine of the stepper motors is pretty awesome on this one. The delta concept uses a central head on three arms angled down from above. If the LED is also pointed down it won’t light up the hardware and that’s why it doesn’t show up in the image. We’ve seen similar accuracy when using this style of machine for 3D printing. But if you don’t want to build a complicated machine you can try this out with a simple string plotter. This 3d printing delta robot really seems to solve a lot of the hurdles faced by previous offerings. With other delta printers we’ve looked at the motor control of the three arms is usually a it complicated. On this build the motors can just be seen in this image at each corner under the build platform. Each motor has a belt that loops from the bottom to the top for the machine, driving an arm along two precision rods. It’s also interesting to note that the printer head doesn’t have a motor mounted on it for feeding the filament. Instead, the motor is mounted remotely. You can see it above the soda can in this image. It feeds the filament through a hollow tube spanning the gap between the extruder and the motor. This acts as a Bowden cable. With less mass to move this may make it easier to control the location of the print head. After the break you can catch a clip of the team showing off the speed and dexterity of the delta bot, followed by a printing demo. [Pythagoras] is a delta robot built originally using RC servos. Humbly, [Aaron] “concedes” that the first version of his delta robot using hobby servos was easy to build. As anyone who has built any kind of robot knows though, there is definitely a lot of work involved in even the simplest robot. Coordinating three axes and programming it to draw a picture is a really great accomplishment. The second version, however is currently in development and uses stepper motors instead of servos. These upgraded motors should make the robot faster, more controllable, and more accurate. This version is at least somewhat working as evidenced by the time-lapse video after the break.